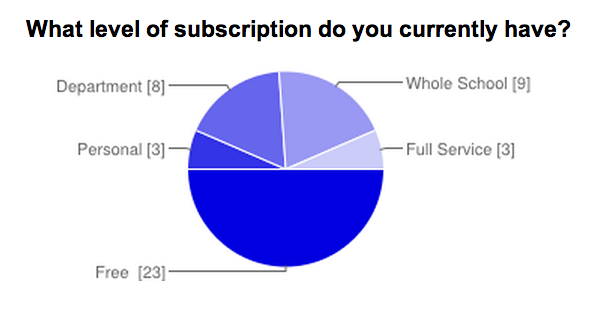 Looks like people are getting survey fatigue: only 46 responses to this one. Still worthwhile, though. This looks fairly representative of the population as a whole. 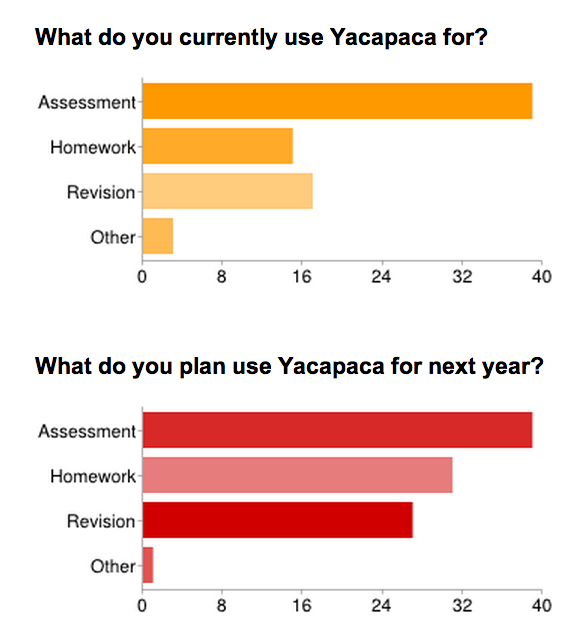 What do they use Yacapaca for? My interest here was how plans are changing. Homework and revision are both on the way up, but I was surprised to see homework featuring more in future plans than revision does. Here are some of the feature requests that came up. My apologies if yours is not covered. Flight paths. I think we should replace the Progress Charts with these. Per-student usage report, especially for revision. Re-insert incorrectly answered questions into the quiz at a later point. Yes, we have that! It’s in Revision Streams but not in quizzes as this would sabotage the quiz as a summative assessment. Tests correlated to national standards (e.g. National Curriculum). They all are. If you don’t see the results you need, check the settings of the student set. Resources matched to the National Curriculum. All that can be, already are. If you want more, write them. See results analysed by gender, SEN status, etc. If you have that metadata in your student records, then this analysis is now available from the Assignments list. It’s a brand new feature, so no shame if you didn’t know that was there. See student sets even when they have no results. You can see these in the list of student sets, from the top of the Students dropdown. See a report immediately after a quiz is finished. Access all reports via the dropdowns in the Assignments list. No need to wait for the email. Moodle integration. What a waste of money that was. Even the people who had campaigned for it didn’t use it in the end. Author control over quiz timing. Utter chaos until we removed that. Most authors didn’t have a clue how to use it, but used it anyway – the result was a total mess for the rest of us. Allow students to use the Back button in tests. What happened? The kids would guess the answer, then repeatedly go back until they stumbled across the right one. No knowledge or thinking-through required. Sign-on integration with your local system. We’ve looked into this several times and the bottom line is it’s a morass. It never works as well as you hoped, and breaks whenever any of the other vendors changes their system. What we do have is brilliantly simple tools to upload students and for them to then set their logins to something easy to remember. Use them! Edmodo integration. I appreciate that Edmodo is the new Moodle, but that does not make it any more attractive from my point of view. Anything involving printing out. This is the 21st Century. Overall, no-one asked for anything gobsmackingly new or different, but I did get a strong steer that we should focus on homework as a key use-case. It is also clear that we are falling down on user education. Given that I can’t have one-to-one conversations with every teacher, I need to find more ways to facilitate teachers helping each other. This entry was posted in Yacapaca and tagged features., survey, yacapaca. Bookmark the permalink.